Tour Australia in Style. Buy Tilt Train Tickets at International Rail. Particularly for destinations to and from tropical Cairns, including Tully, Townsville, Proserpine (for Airlie Beach and the Whitsundays) and Mackay, the Cairns Tilt Train offers quick, efficient connections to and from the wonders of the Great Barrier Reef and beyond. Or use the Rockhampton and Bundaberg Tilt Trains for fast services to and from Brisbane for destinations including Nambour and the Sunshine Coast, Maryborough West (for Hervey Bay and Fraser Island), Bundaberg, Gladstone and Rockhampton. Following exactly the same route and stops as The Sunlander, including the Trainlink Coach connections out to the coast, the innovative Cairns Tilt Train travels twice a week in either direction between Brisbane and Cairns, taking approximately 25 hours and bringing a modern twist to this classic journey. The Cairns Tilt Train Club Car offers light meals and refreshments with a Trolley Service also providing in-seat service. The Cairns Tilt Train offers one level of service - Business Class. The seating features large reclining seats with footrests, individual reading lights, audio controls built into the armrests and headsets. Each Business Class Seat also has its own personal audiovisual system providing the latest in entertainment via personal screens, plus a laptop connection and power supply. For optimum space, carriages are designed with two seats one side of the aisle and one the other and there are toilets and showers at the end of each carriage which include facilities for disabled passengers and baby changing tables. Connecting you with all the major holiday destinations of the south-eastern Queensland coast, the Rockhampton Tilt Trains travel Rockhampton-Brisbane daily and Brisbane-Rockhampton every day except Saturday. For added services, the Bundaberg Tilt Trains travel Brisbane-Bundaberg, Monday-Thursday and Bundaberg-Brisbane, Monday-Friday. A trolley service operates to your seat for light refreshments, confectionery and drinks, and takeaway meals, newspapers and magazines are also available from The Galley. For your entertainment, TV monitors are positioned overhead. 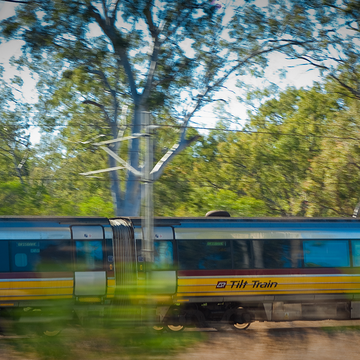 On board the Rockhampton and Bundaberg Tilt trains, passengers can choose between Business or Economy Class Seating. Business Class Seats are larger, reversible seats in a 2 x 1 seating configuration with access to power points for computer usage and Economy Seats are 2 x 2 in a coach style carriage. To for further information or to book any Rail Australia journey please complete a Journey Request Form or feel free to contact us.